Cookie Recipes – Get Cooking! Fellow Cookie Monsters, look alive. Here's a collection of our favorite cookie recipes. 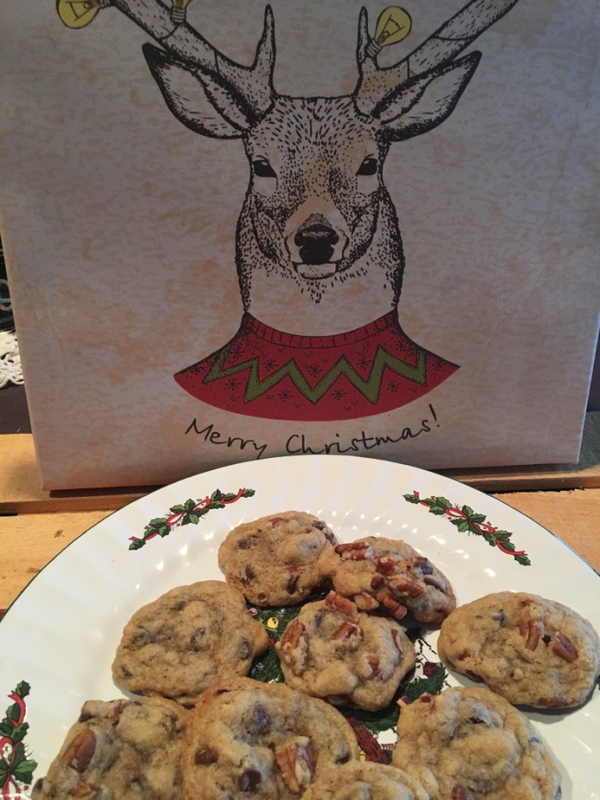 It's never the wrong time to bake cookies, so find a recipe you love and get baking! Before I had to give up gluten/wheat (health reasons), I baked cookies almost weekly. That’s what we Cookie Monsters do. Once I had to swear off all of the traditional cookie ingredients, I pretty much had to swear off making cookies weekly (gluten-free flour and other ingredients are much higher). I did not, however, at any time swear off being a Cookie Monster – so I have certain favorite recipes I use again and again. 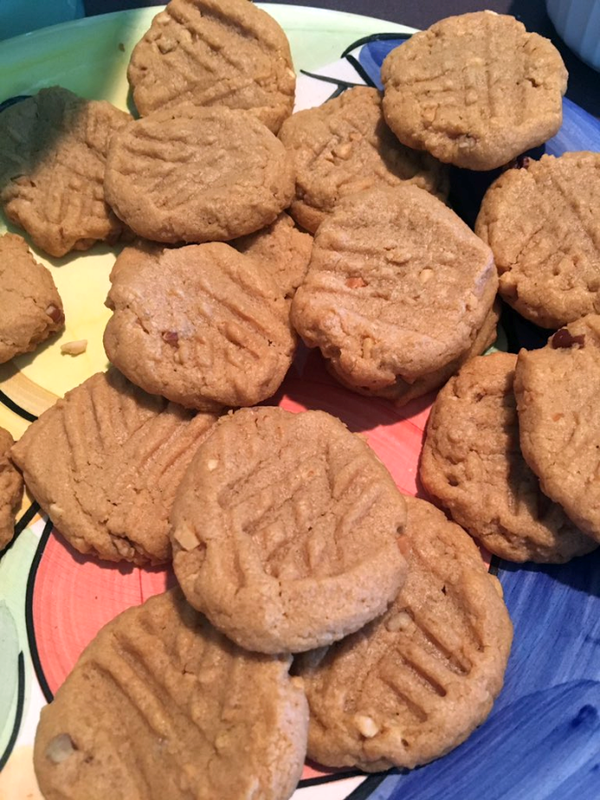 The Peanut Butter Cookies recipe below is a favorite – of mine as well as everyone else that gets within reach of these delicious cookies. While their flavor is the best thing about them, their few (cheap) ingredients and level of insane easiness to make run a close second and third. 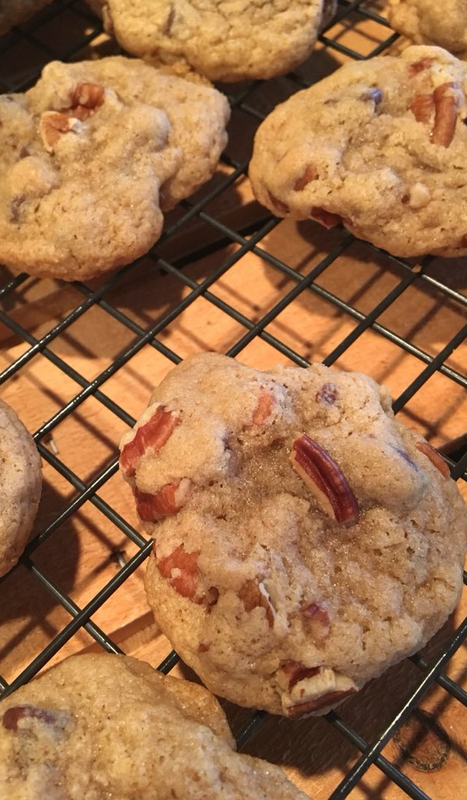 You’re going to love these cookies for all of these reasons. 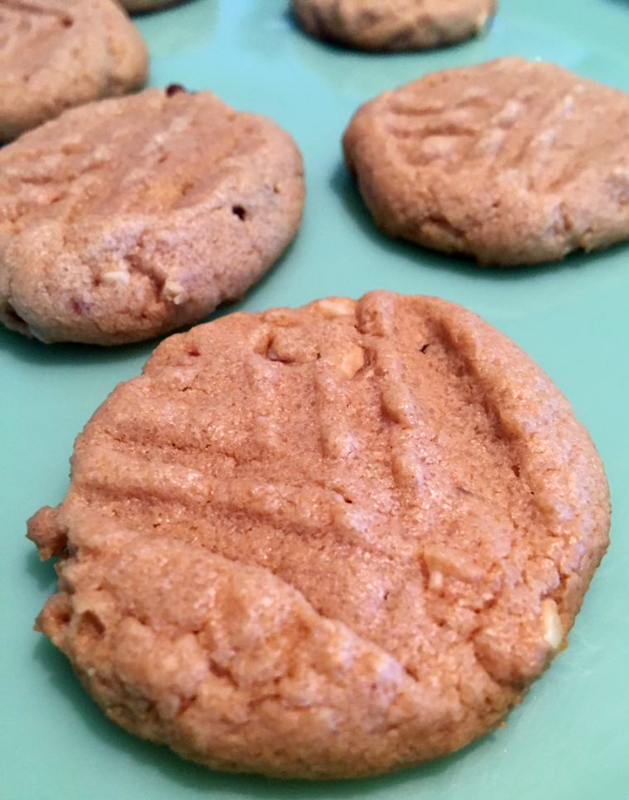 You’ll want to keep this cookie recipe handy for Christmas, birthdays, game days, and any day that calls for a yummy peanut butter cookie. Combine the peanut butter, sugar, and egg - stirring well. Stir in the chopped peanuts, if using. Spoon cookie dough onto ungreased cookie sheet. Dip a fork into extra sugar, then press a "crisscross" design on top of each cookie. This not only looks cook, it keeps the cookies flat. Bake at 350 degrees for 6-8 minutes. 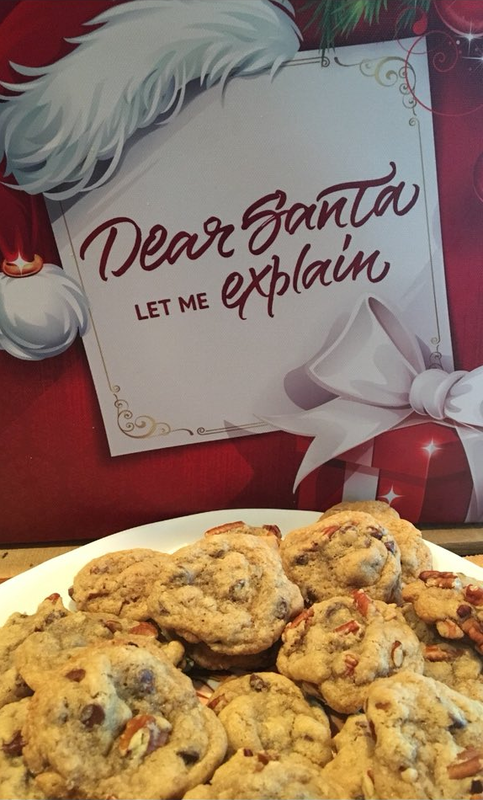 Don't over-bake these cookies - it's actually better to take them out a little early than a little late. See those little bits of oats, white chocolate chips and coconut? 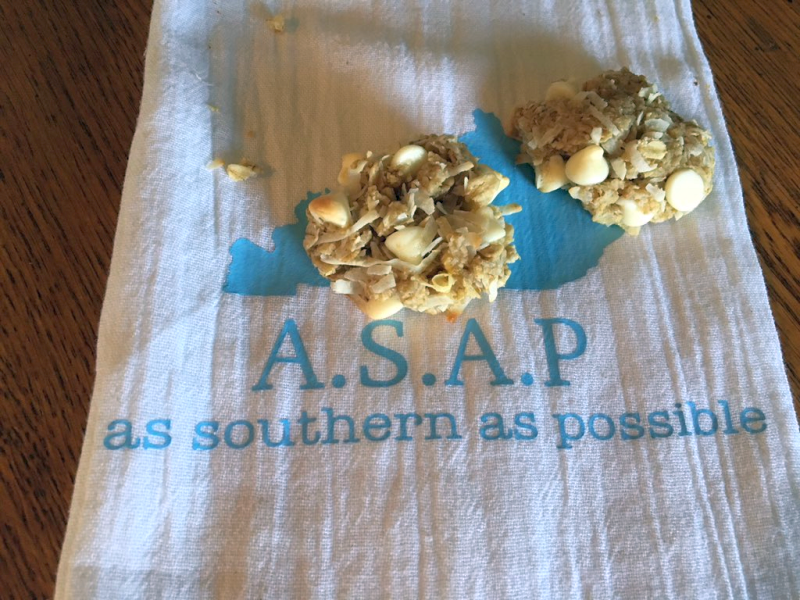 HEAVEN!Black Bottom, Monkey’s Eyebrow, Big Beaver Lick, Marrowbone, Rabbit Hash, Booger Branch… yep, they’re all small towns here in Kentucky with pretty unforgettable names. I have a whole list of them and am going to spend some time researching the story behind the names this year for my Kentucky blog. I can’t wait to learn the story behind Booger Branch. Small towns in Kentucky have always fascinated me. While our larger cities are absolutely wonderful – in fact I call one home – Kentucky’s small towns are where you’ll really find its personality. The friendly Kentuckians who wave at perfect strangers and will gladly talk your ear off if you let them, the churches with their can’t-miss sassy signs, the American flag waving proudly in front of every school and many businesses, the sleepy downtowns, and the University of Kentucky colors everywhere you look… yep, that’s us! One of the most trustworthy names in the gluten-free business.A few days ago, I got a wild hair to come up with a gluten-free oatmeal cookie. Oatmeal cookies have always been a personal favorite – seriously, I just can never get enough. So, I decided that I’d start with Bob’s Red Mill Gluten-Free Old Fashioned Rolled Oats and Gluten-Free Oat Bran. I figured that combo would give me the oatmeal taste I was craving, if anything would. 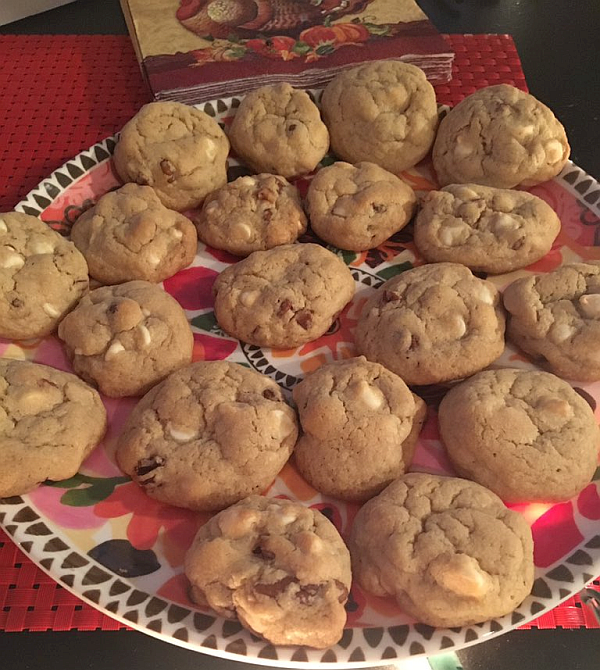 I decided to add a few other favorite obsessions to the mix (literally): Coconut, white chocolate chips, and vanilla (as is my style – twice as much as the normal person). 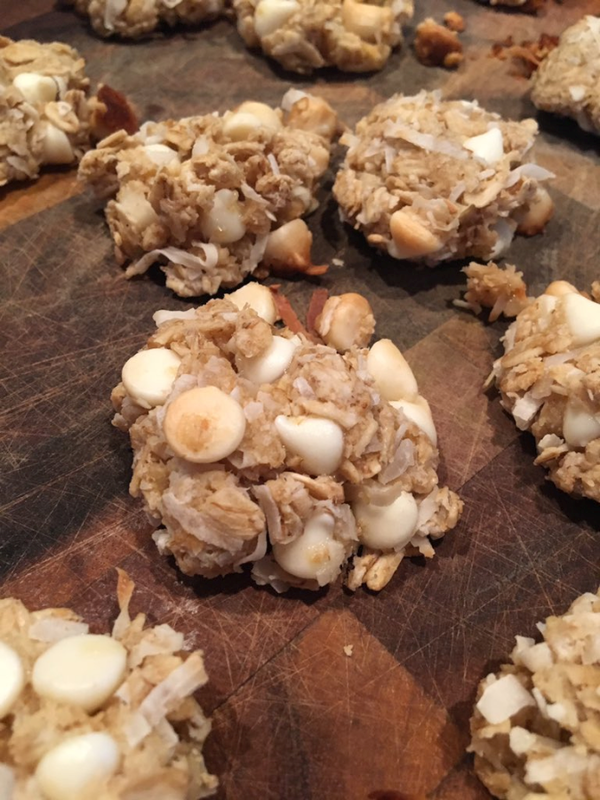 Gluten-Free Cookies that were somewhere between crunchy cookies and chewy protein balls. 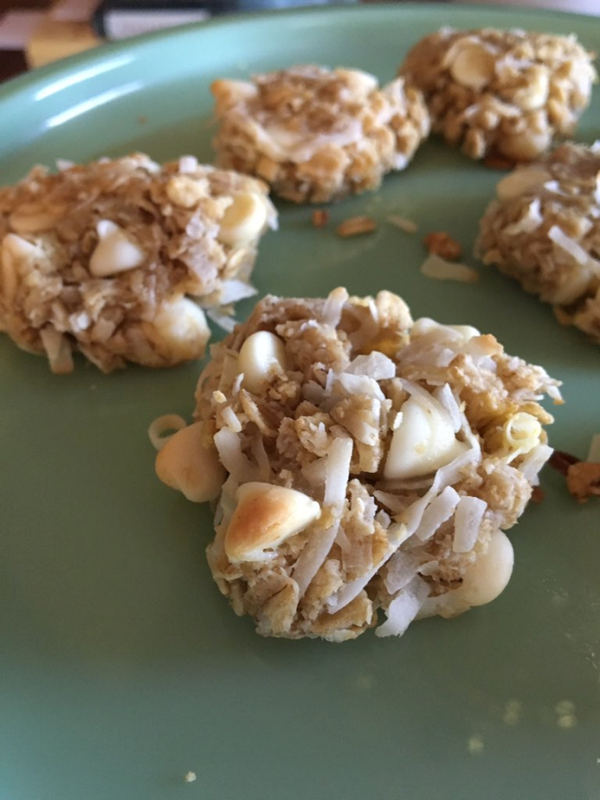 Cookies with no added sugar (in addition to what was already present in the shredded sweetened coconut and white chocolate chips) but that tasted so good even kids would love them. Fewer than 5 ingredients – I have nothing against ingredients, mind you. In fact, sometimes that’s the way you can achieve layers of flavor. However, that’s also the way your favorite ingredients can get hidden and lost in the mix. That wasn’t going to happen to the oats, coconut, vanilla, and white chocolate on my watch. The ingredient list, counting water, was right at 5 – so I cut myself a little slack. Simple process. As in.. as simple as possible. When we cookie fiends want cookies, we want them fast – without a lot of hoopla. I wanted “mix and bake” and that’s what I came up with. Cookies small in size. Here’s the thing – I am a Cookie Monster from way back. I’m seldom any happier than I am when prancing around with a cookie in one hand and an Agatha Christie Hercule Poirot mystery in the other. When my metabolism turned on me “this” side of 30, I found that if I make my cookies smaller, I actually consume fewer calories. I outsmart my inner cookie fanatic this way and she hasn’t caught on yet. I wanted the cookies to pretty much explode with my favorite cookie flavors: Oats, Coconut, White Chocolate, and Vanilla. I wanted a gluten-free cookie that was as delicious three days later as the first day they were made. That’s rare with gluten-free cookies. These actually are, though! Simple but Delicious – Now, That’s Southern FoodWhen I started gathering my ingredients, I couldn’t help thinking that I’d made myself a pretty tall order. Heckity heck, they’d have been lofty enough goals for coming up with a NON gluten-free cookie, but it was almost nuts for coming up with one that was also gluten-free. You see, gluten-free baking is a beast all in itself. Gluten-free cookies, pies, bread, and cakes are as unpredictable as 3 year old humans, 6 month old puppies, and cats of ANY age. Like each of these live wires, gluten-free baking not only has its own set of rules – it seems to make them up as it goes along. Like cats. Fortunately, I’m a crazy cat lady and have raised three daughters. Nothing shocks me. While it isn’t a necessity, I do line my cookie sheets with parchment paper when baking cookies. VERY important – when baking cookies in batches (such as this), allow your cookie sheet to cool completely between each batch. That, or use several different sheets. When you place cookie dough on a warm cookie sheet and put it into the oven, the cookies will spread like a… nevermind. They spread. You can either form these into balls OR form them into balls, THEN flatten them slightly for “patties.” There is not wrong way. I tried both ways and found that both were delicious. Bake for 8-10 minutes. I hate when I’m unable to give a precise time, but ovens vary. For what it’s worth, mine were consistently ready after 8 minutes. Remove to a platter or cooling rack (be careful, these guys are crumbly) and allow to cool completely. These babies are simply delicious and filled with the flavors I love. Given their simple charm, these cookies catch you by surprise with their layers of deliciousness. I guess that best explains why I named them after a small town in Kentucky. That… and the fact that they’re pretty unforgettable. 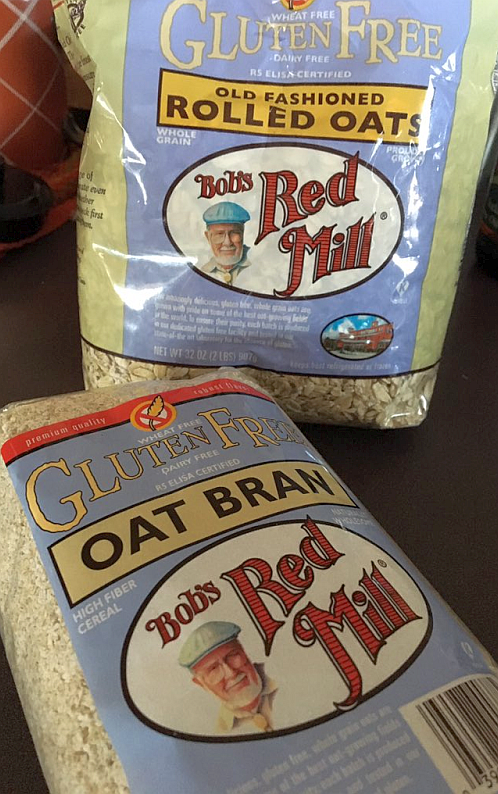 Where Can You Find Bob’s Red Mill Products? Bob’s Red Mill products are available in just about all grocery stores and department stores. They’re also available online, of course. In fact, Bob’s Red Mill’s Website offers free shipping on most orders over $50, so that’s a great place to stockpile. In keeping with the whole honoring small towns in Kentucky with dessert recipes theme, next up is Black Bottom… I have a distinct feeling chocolate will be involved with this one. Gluten-Free Cookie Truffles with Glutino Chocolate Creme CookiesChocolate? Check! 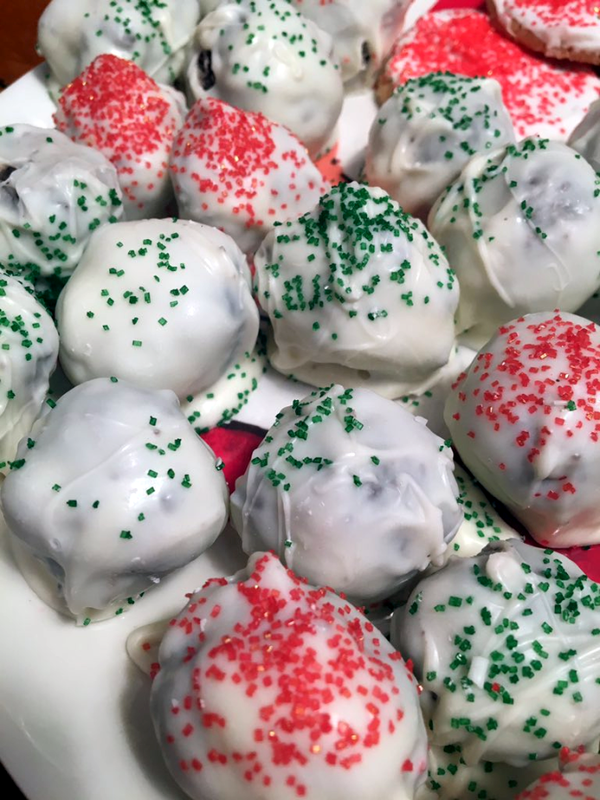 Que the song, “… these are a few of my fav-O-rite things…” – is it any wonder I’m obsessed with these cookie truffles? These truffles call for Glutiono Chocolate Vanilla Creme Cookies (which are beyond delicious on their own, by the way – they’ll rock your world with a glass of milk). 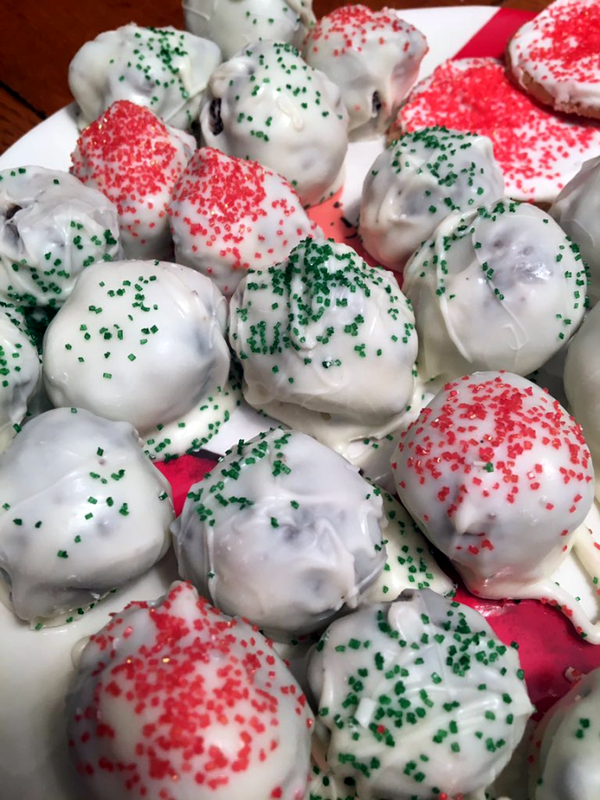 The traditional truffles call for a package of Oreo cookies – but they’re certainly off-limits for those of us who have to avoid wheat/gluten. Thanks to Glutino we don’t have to miss out on chocolate sandwich cookie truffles. I’ve actually found that, thanks to companies like Glutino, we can pretty much have and enjoy anything our counterparts have. It just takes a little more planning and creativity. Glutino Chocolate Vanilla Creme CookiesI normally sprinkle the tops of these truffles with reserved crumbs from the cookies, but these were made last week for Christmas, so colored sugar festivities ensued. Mix softened cream cheese and cookie crumbs until well blended (if you want to top the truffles with crumbs, reserve some to the side). Shape the mixture into 1 inch balls and place on a parchment-lined cookie sheet. Place the cookie sheet in the freezer for 20-30 minutes. This makes them hold up better when it’s time to dunk them in the white chocolate. Melt the chocolate when it’s almost time for the truffles to come out of the freezer. I melt them either in a double boiler type situation (big bowl over a pan of boiling water) or in VERY short intervals in the microwave. Burning the white chocolate is a miserable, ugly thing – so go slowly… as in 30 seconds at a time. Dip each ball into the melted chocolate and quickly top with either cookie crumbs, sprinkles, or colored sugar. You could also drizzle melted caramel on top and sprinkle it with a little sea salt – if you’re feeling fancy, you know. Allow the truffles to hang out in the refrigerator for 15-20 minutes to set. I hear of people storing these truffles in the refrigerator but, in my house, it never comes to that. They’re gone before I could even open said refrigerator. 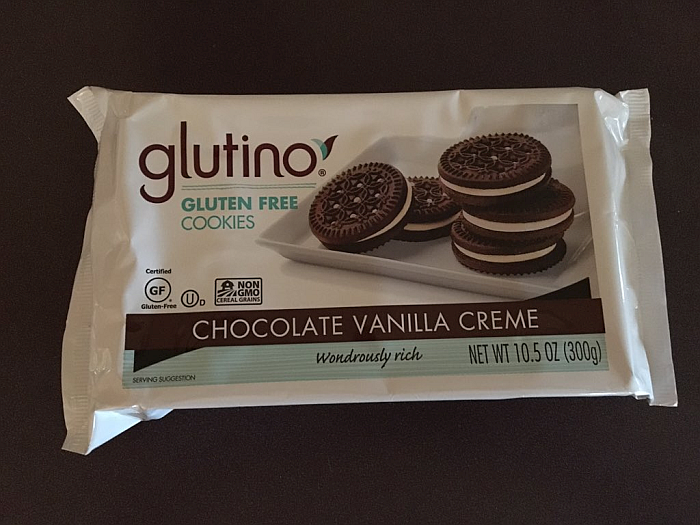 You can find Glutino Chocolate Vanilla Creme Cookies in just about any grocery store. You can, of course, also find them on Amazon. 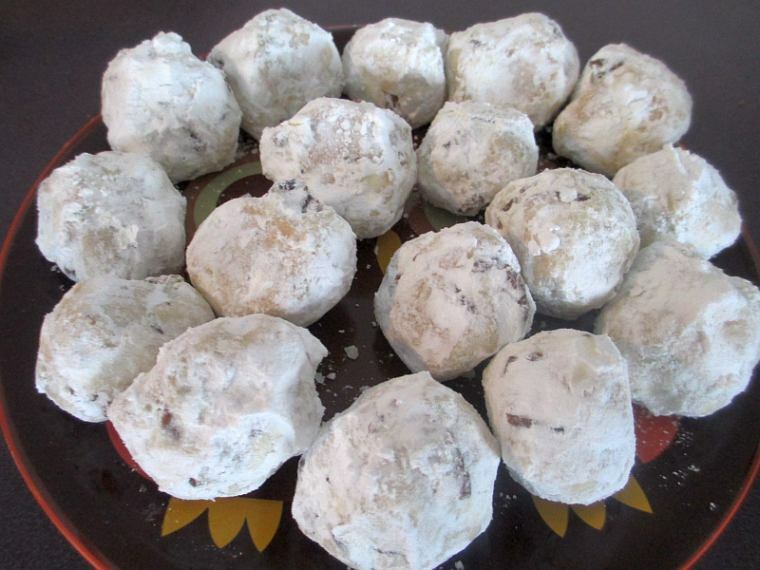 When it comes to Christmas cookies… or any cookies, for that matter… one of my absolute favorites is Pecan Sandies (sometimes called Mexican Wedding Cookies). My favorite cookies are usually “nutty” and always extra-sweet and these cookies more than fit the bill. When I had to give up gluten/wheat (my body’s decision, not my mind’s), I was pretty sure the days of being a cookie monster were behind me. Fortunately a lot of food companies have been busting their rears perfecting All Purpose Gluten Free flours and have, as a result, opened up a whole new world to the gluten free crowd that we once thought was closed for good. Granted, some of these “1 to 1” all purpose gluten free flours can be pretty expensive, but the one I recently discovered is, shockingly, just a bit more than regular flour. The fact that I’ve used it in A LOT of old favorite recipes as a substitute for traditional flour with spectacular results just blows me away. 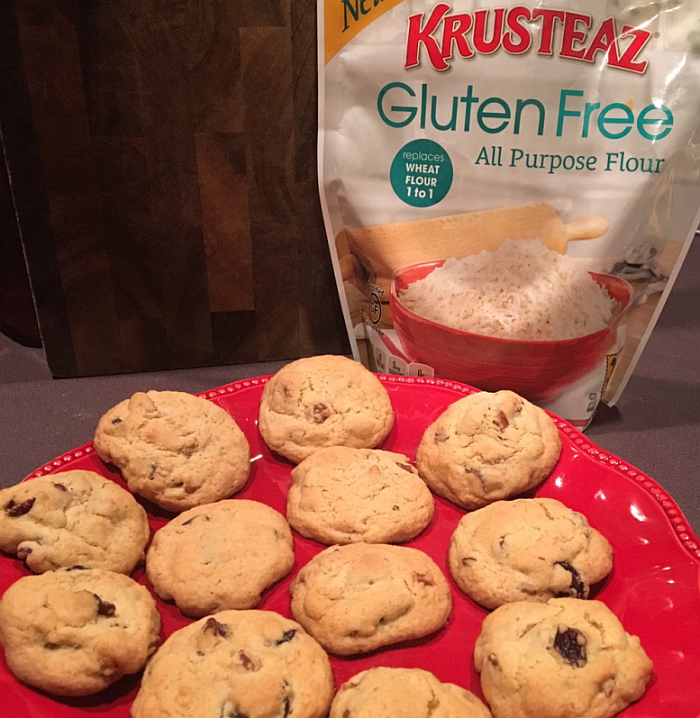 Krusteaz Gluten Free All Purpose Flour is a a dream come true for this gluten free cookie monster and the fact that it’s also affordable is even sweeter. Emily loves these so much, they’re worth the extra effort..
It’s pretty easy to tell my favorite cookbooks from the rest. Below is the recipe, as it appears in the cookbook EXCEPT that I replaced “all purpose flour” with Krusteaz Gluten Free All Purpose Flour. 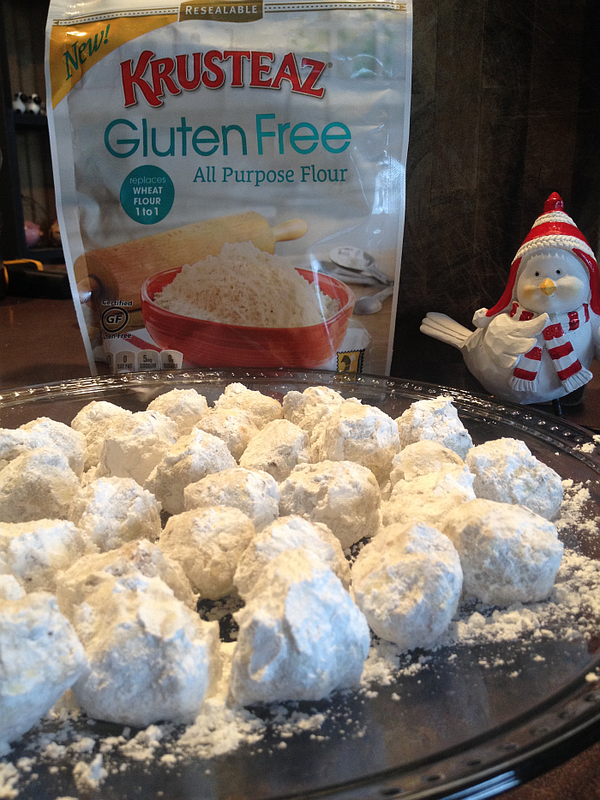 If you have another gluten free all purpose flour you’d like to use, by all means, give it a try! I personally haven’t tried other gluten free flours so I can’t promise they’ll be as great as these were. Needless to say, if you don’t have to eat gluten free, simply switch out the gluten free all purpose flour for the traditional one. Either way, you’ll have a cookie that’s as delicious as it is pretty. In a large mixer bowl, beat butter or margarine till softened. Add water and vanilla and beat well. Bake in a 325 degree oven about 20 minutes or till done. 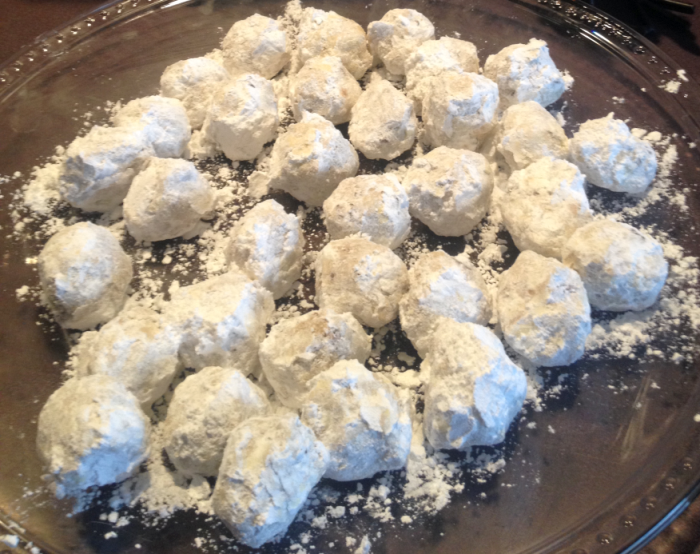 In a plastic bag, gently shake a few at a time in powdered sugar. Chocolate chip cookies are America’s favorite cookies to bake, share, and (especially!) eat. I’ve always loved making each batch a little different from the previous batch, just to keep things deliciously interesting. Adding various nuts and/or peanut butter chips or white chocolate morsels is a easy way to experiment with different flavors. Another easy and flavorful to switch things up is to use different vanilla extracts. 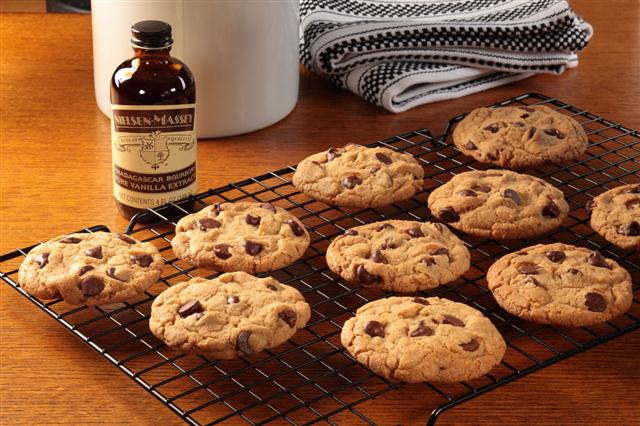 The sweet, creamy flavor of Nielsen-Massey Madagascar Bourbon Pure Vanilla Extract adds a whole new dimension to chocolate chip cookies and it’ll blow you away. Heat oven to 350 degrees. Mix butter, sugars, vanilla and eggs in large bowl. Stir in flour, soda, salt, baking powder and cream of tartar. Stir in chocolate chips. Drop with a #40 scoop (looks like a metal mini ice cream scoop) or a rounded measuring tablespoonful about 2 inches apart onto an ungreased insulated baking sheet. Bake 12 to 15 minutes or until light brown. Cool slightly: remove from baking sheet. Cool on wire rack. 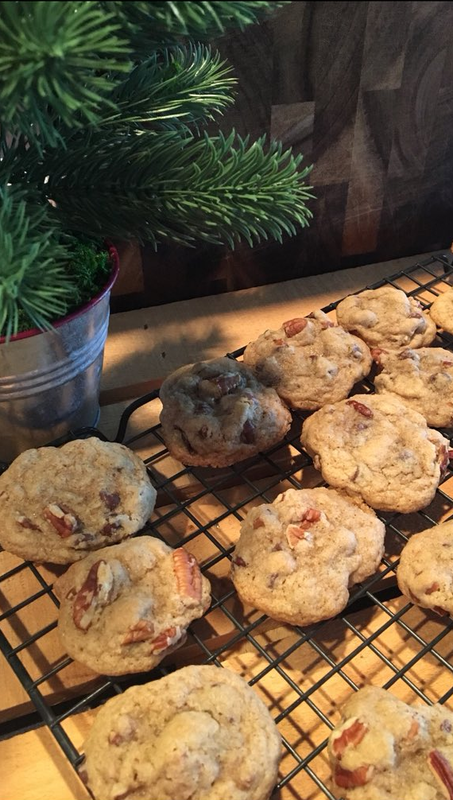 Makes about 4 dozen crackly, chewy-crispy bakery-style cookies. They are wonderful! Switch the chips: Instead of using 2 cups of semisweet chocolate chips, try using white chocolate chips, dark chocolate chips, or a combination of all three. Using coarsely chopped baking chocolate instead of chips will add a gourmet feel to the recipe. Make it nutty: Try adding 1 cup of coarsely chopped nuts to the batter. Pecans or walnuts are a classic addition, while macadamia nuts or pistachios add a bit of a nontraditional flair. Salt the tops: Baked goods aren’t just about the sugar; salt amplifies the flavors in even the sweetest recipes. Sprinkle the tops of your cookies with coarse sea salt just before baking to bring out the flavors of the brown sugar and chocolate in this recipe. Try using a smoked sea salt for an extra-special touch. Build a sandwich: Pair this recipe with your favorite ice cream flavor for the perfect ice cream sandwich, or spread them with buttercream frosting for a cookie sandwich treat. Use a peanut butter frosting for that classic chocolate and peanut butter combination that everyone loves. Recipe and Photo Credit: Nielsen-Massey Vanillas and Renee Hartzler. As pointed out in a festive short video on Targets “A Bullseye View,” Peppermint makes the Christmas season even more beautifully delicious and deliciously beautiful (click here for the video). Whether it’s something as simple as hanging peppermint candy canes on the tree or baking beautiful peppermint desserts – like the cookies below – peppermint just makes the season feel more festive. 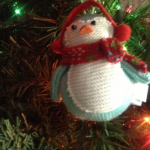 After reading the recipe, check out a few of the adorable Christmas decorations available on Target.com and in Target stores. 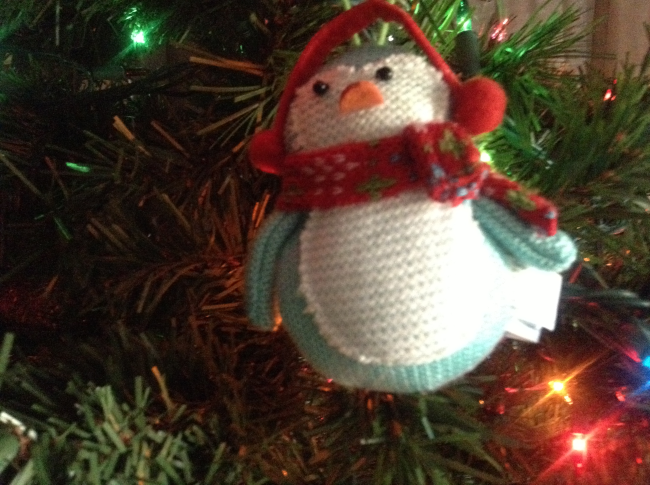 I recently raided our local Target and came out with 14 different Christmas decorations! Once I got started, I couldn’t stop. Seriously, two of my three daughters were with me and they couldn’t even slow me down. 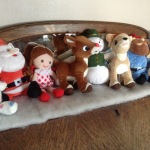 Over the years, I’ve collected A LOT of Christmas ornaments. 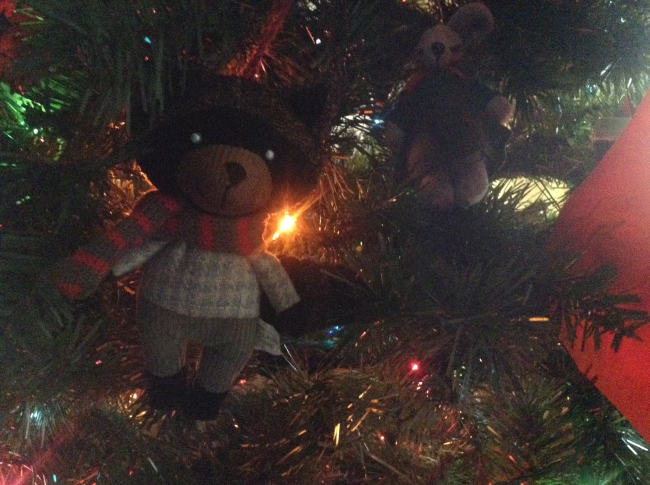 I always buy ornaments that “represent” the different members of my precious family. 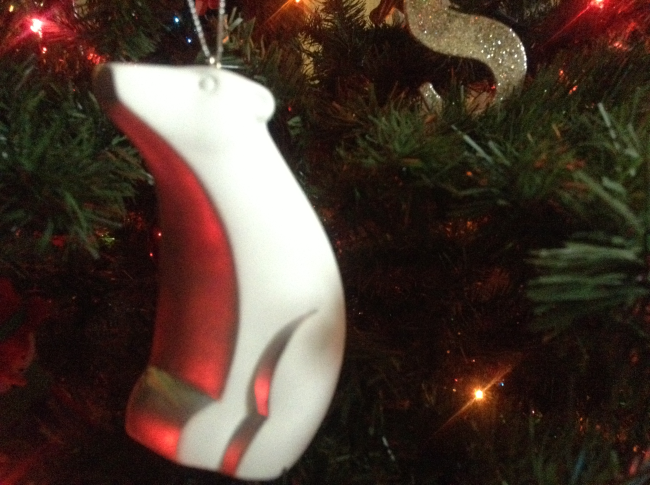 Some ornaments represent an animal someone’s crazy about (cats, pigs, and polar bears for me… penguins for Emily..), favorite hobbies, favorite cartoon characters, favorite Christmas movies, etc. 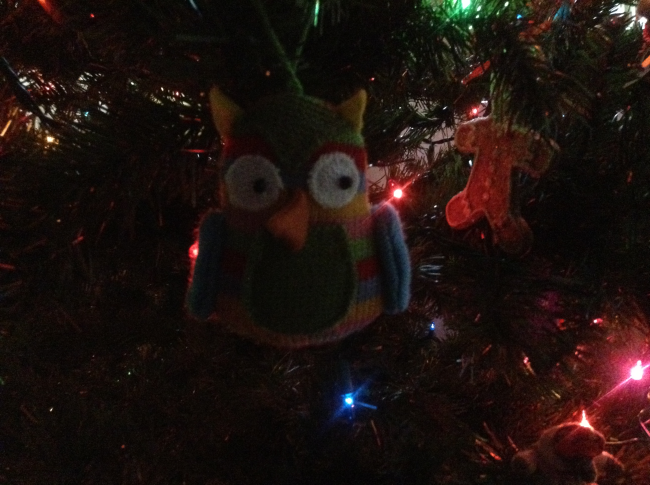 I also encourage everyone top pick out one or two ornaments each year that catch their eye. 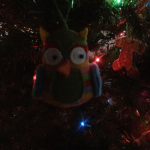 Needless to say, I spend a great deal of time looking for ornaments and I give you my word – Target has the best selection of original ornaments AND the best prices on ornaments. They also have tons of ridiculously beautiful stockings out this year. I came thisclose to getting new stockings for everyone. The idea’s still on the table – they have some seriously gorgeous stockings this year. 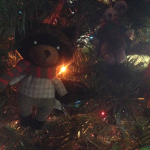 On this recent trip I grabbed 5 different ornaments and promised at least 10 that I’d be back for them. Fortunately, I’m a Target-o-HAUL-ic of my word. 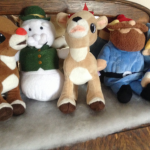 I also happen to collect anything and everything related to Rudolph the Red Nosed Reindeer. I’ve been obsessed with that cartoon since… well… since I can remember. 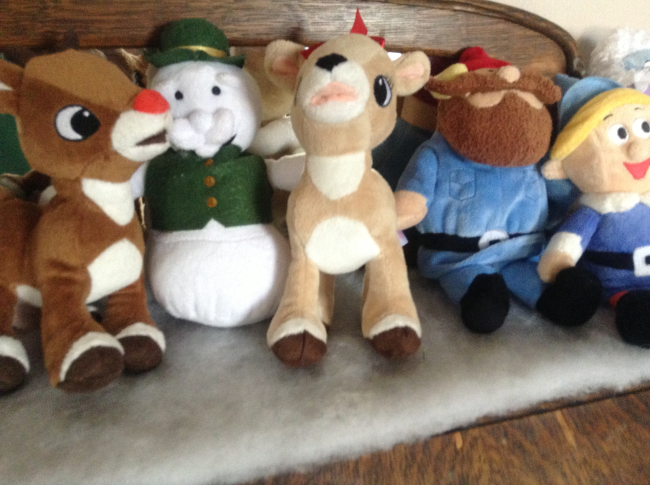 It used to be pretty hard to find Rudolph-related decorations, but Target hooked me up but good this year. 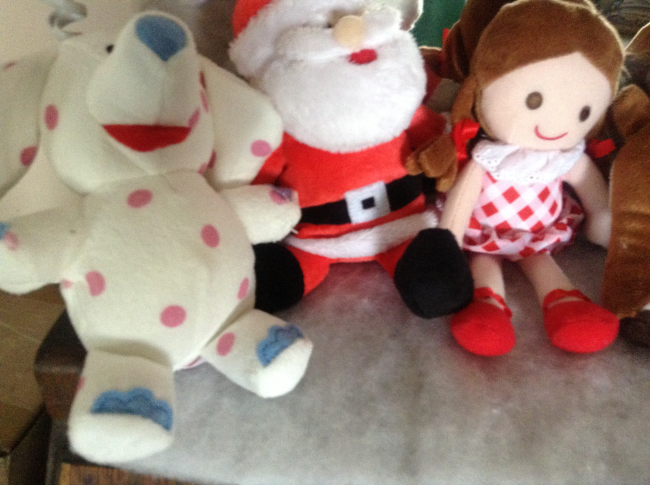 They have the most adorable little stuffed replicas of the characters and, yes, of course I had to have them all. 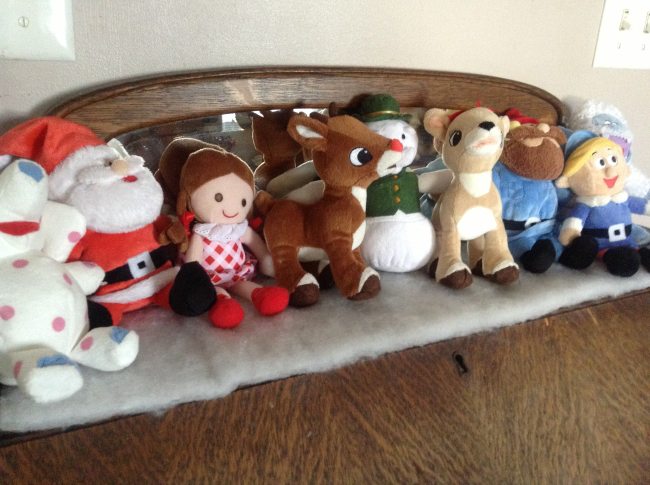 The top of an antique roll top desk has become the North Pole and I can’t promise that they won’t stay out year round. Target.com has A LOT of ornaments and decorations that aren’t available in stores (if you’re an NFL fan, you’ll love the NFL ornaments and gnomes). 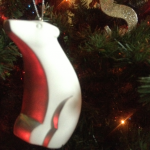 See Target’s Christmas Decorations and Ornaments and, of course, be sure to check out your local Target store. Now for the cookies! The recipe below will make the tastiest and possibly the most adorable cookies you ever had. They’re perfect for gift-giving too, but I’m not sure I could part with them. Beat butter and sugar in large bowl until blended. Beat in egg, milk and extract. Add flour and baking powder; beat on low until just combined. Remove half of dough; press into disc shape and wrap with plastic wrap. To remaining dough, add a few drops food coloring. Mix well. Flatten into disc and wrap. Refrigerate both at least 30 minutes. Place colored dough between 2 large sheets of plastic wrap; roll out to a 12×8-inch rectangle, about 1/4 inch thick. Repeat with plain dough. Remove top sheet of plastic wrap from both doughs. Invert plain dough onto red dough. Gently press and trim edges. Remove top sheet of plastic wrap. Starting with short side, roll up dough into spiral. Wrap tightly; freeze about 30 minutes or until very firm. Heat oven to 375°F. Unwrap dough; cut into 1/4-inch slices. On ungreased cookie sheet, place slices 1 inch apart. Bake 8 to 10 minutes until set. Cool 2 minutes; remove from cookie sheet to cooling rack. Store in an airtight container. Gift Giving Idea: Wrap individually in cellophane and tie with ribbon for gift-giving! If you’re like me, you’re just now starting your Christmas shopping. Sometimes it’s tough to come up with original gift ideas that you know your loved ones will actually use and enjoy. None of us have so much money just lying around that we can risk buying something for someone that they may never use. 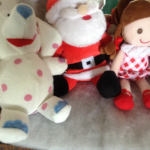 Below are the Top 10 Gift Ideas (well, according t me, anyway) from Oh! Nuts. Click each for more information. There’s one thing for certain when it comes to food gifts – they will be used and they will be enjoyed. 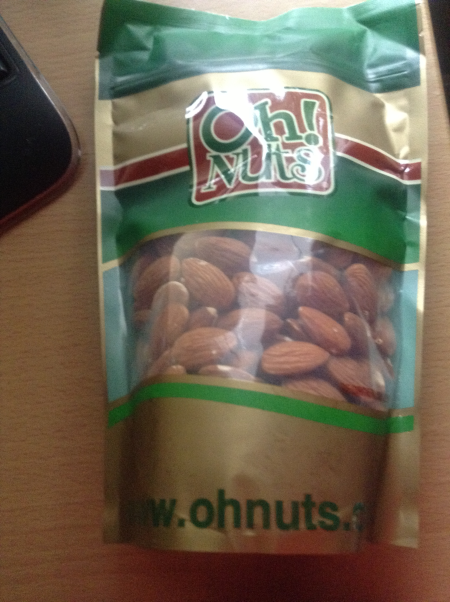 Simply buy their favorite nuts in bulk and put them in a gift bag. They’re nutritious, delicious, and make a perfect snack. Bulk Pistachios are always a hit. 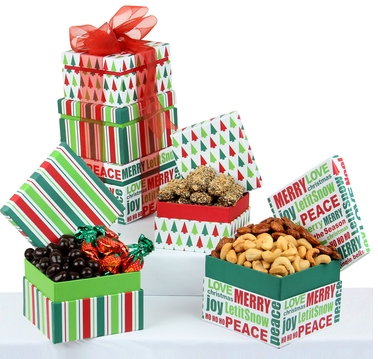 ‘Tis the Season Holiday Gift Tower: Three festive boxes filled with Delicious Premium Nuts, Candy & Chocolate. Beautiful Large Holiday Beaded Gift Tray with Jordan Almonds, Christmas Chocolate Cordials, Roasted Salted Pistachios, Cashews, Chocolate Covered Peanuts, and more. The beautiful tray can be kept and used. Golf Ball Nut Gift (pictured below) – Beautiful ceramic bowl shaped like a golf ball and filled with nuts of your choice. Love this! Let it Snow Hand-Decorated Cookies – These are extra beautiful (pictured below). Truffles Gift Box – Great assortment of top-of-the-line parve praline filled chocolate truffles that are surprisingly inexpensive. Basketball Nut Gift – Like the Football Nut Gift, but with an adorable basketball instead of football. There’s also a Soccer Ball Nut Gift! For anyone with a sweet tooth, Oh! Nuts has the best gift ideas imaginable. They have everything from a Tripod Chair Nosh Galore (a usable, comfortable chair that folds flat – filled with delicious snacks and candies… an insanely original and unique gift idea) to Mini Gumball Machines. There are countless other Christmas and Hanukkah gift ideas. Click through any link shown and see all the original and delicious ideas. You just can’t go wrong when you give deliciousness as a gift.